80/20 – Can you live with that? The 80/20 rule is not an Agile concept. It would be considered a super belief applicable to many management streams and yet its relevance in the sphere of ‘Agile’ is pretty high. The mathematical basis is from the Pareto’s Principle that was further expanded by Dr Joseph Jurin. Jurin observed that 80% of value was earned through only 20% of work. We take Jurin’s observation and apply it strongly in Agile – always ensuring that the highest value work is done upfront. In this respect if you delivered 20% of the requirements then most of the business value would have been achieved and you can ship vastly earlier than needed to begin reaping reward. The 80/20 Rule does not apply to Quality. When you write the acceptance tests that you will qualify the story against you cannot stop testing after 20% of the tests are done. Granted that 80% of the testing’s value might be in 20% of the tests this isn’t something you can be half-hearted about. A story is done when all of its acceptance criteria are met not when 20% is met. The 80/20 Rule applies to the initial upfront workshops when a backlog and common consensus amongst the team is being formed. This ties in closely with the manifesto value “Responding to change over following a plan”. Why overbake the backlog when in all likelihood it is likely to change? 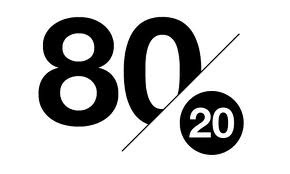 The 80/20 Rule applies to the generation of a strategic vision or any other team consensus related activity. We expect an agile project that has a six month end delivery date to change often, so why don’t we expect a strategic vision to be the same, especially as they are usually set at the three year mark. When pondering the above recently the third heuristic is the one that made me reflect. After some recent team days we spent quite a bit of time in the strategic zone or in general consensus activities. We all knew the 80/20 rule and yet we didn’t follow it. The big question was why? Was it because Agile itself encourages collaboration and everyone to have a voice? Was it because these sorts of activities are rarely revisited with most teams only doing them once a year and hence there is a strong push because it won’t be adjusted for a year? Or was it purely team dynamics that make the 80/20 rule so hard to achieve? When I first taught planning poker seven years ago I used to use the phrase ‘Can you live with it an move on?’ if consensus wasn’t reached after two minutes of discussion. My reflection over this reminded me that I haven’t used that phrase for a very long time and probably need to bring it back. I have strived for collaboration but in doing so neglected the value that wasn’t being achieved. If someone had said on those team days (or especially put up a poster) saying “80% of the value for 20% of the effort” and “Can you live with that?” I probably would have faught less.